I hate taking forever to do anything. Because I have time for anything to take very long–I have a baby and a toddler and a teen and they all want to eat at different times, nap at different times and the list goes on…So, when I make anything, it has to be fast, easy and worth the effort. My kid’s Halloween Party is one of those times when I need something that’s fast, easy, but worth the effort. 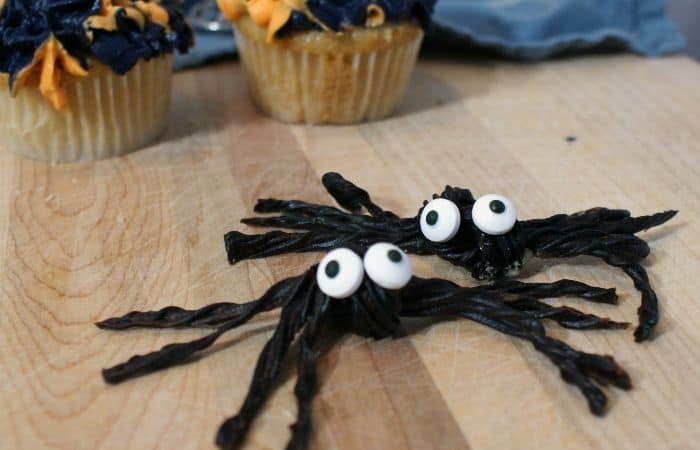 So, I’ve been coming up with awesome ideas, including these Easy Candy Spiders. I can make a dozen of these in less than 10 minutes, making this a total win for me. 1 q-tip or the end of a spoon…whatever. *Please note, these must be made one at a time, as the redvines cool too fast after being in the microwave to be able to make the candy spider body. Place redvine in the microwave for 10 seconds. Very carefully (because it’s hot), remove the redvine from the microwave and cut of both ends (just a 1/4 inch should do). Tie a knot in the middle. Be careful not to tie it too tight or the redvine will break, but not too loose or it won’t stay tied…middle ground here, middle ground. Using a sharp knife, cut each leg of the redvine in half. Then cut each half in half again, making 4 legs on each side of the spider. Trim all legs to an equal length. Using a q-tip or the end of a spoon, place a drop of corn syrup on the back of an eyeball and affix to the spider’s body. Repeat with the eyeball business so there’s two eyes. Repeat all steps until all 5 spiders are complete. Need a more in-depth “how to”? Check out this ridiculous video I shot of making these silly candy spiders! 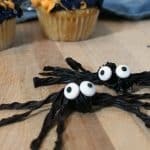 I've been coming up with awesome ideas for my son's Halloween Party, including these Easy Candy Spiders. I can make a dozen of these in less than 10 minutes, making this a total win for me. Very carefully (because it’s hot), remove the redvine from the microwave and cut of both ends (about a 1/4 inch should do).